Emojis have become a cultural phenomenon, and now you can bring the fun to a face near you. Emoji Masks are your favorite emojis—from sly face to smiley face—brought to life. Made with durable plastic to fit anyone, the masks are simple and affordable. For Founder Marshall Haas, it all started with the “moon face.” He and his colleagues used this popular emoji so much that they had an idea: why not bring it from the virtual world into the real one? Emoji Masks were born. 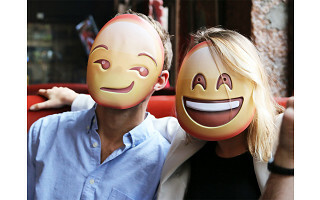 So whether you want to cheer a friend up or just want to be the hit of your next costume party, Emoji Masks mean the fun doesn’t need to end on screen. Hi everyone! 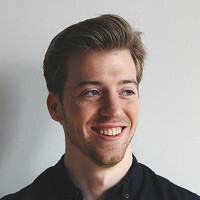 I'm Jason, the Head of Operations for Emoji Masks. FINALLY, you can wear your favorite emoji. On your face! I'd be happy to answer any questions you have! I imagine there are openings for your eyes. How is it for breathing comfort? Does it get sweaty under that mask like with a lot of Halloween masks? Hi Ross, yes there are holes for the eyes. Breathing is no problem either. Because it does not cover your entire head, there is plenty of ventilation so it is not too sweaty. Hi Rosalynd, the answer to your question is: absolutely not. Comments of an inappropriate nature will not be tolerated. @Mike ...inappropriate??? Asking if the darker skinned mask is a black person?? ?...you should have thought about that before you made the mask so dark, with white eyes!!!! I resent that depiction of my race!!!! Now do you understand? Hi Rosalynd, these emojis are in no way a depiction of any race. Emojis are whimsical cartoon images and only that, as we mention in the video. The mask you are referring to is officially titled "pile of poo." The white eyes are put there to bring that poo cartoon to life. I cannot stress enough that these emojis are not a depiction of any race. They are just supposed to be silly icons. I thought what you called 'pile of poo' was actually like a face of chocolate, as in I'm in the mood for chocolate. I like the idea better. Hi Martie, I thought the same thing at first. Just going by the official name. Pile of poo, dollop of soft serve, I think it works either way. I love The Grommet because you never know what you'll find. These masks are just too silly though. Perhaps those of the younger sort would be goofy enough to enjoy them & they are cheap too. As for the DRAMA in this comment section; *eyeroll* There's a time & place to be OFFENDED but manufacturing OFFENSE over silly emoji masks is absurd! I think I'm actually offended by someone being offended over a poop mask... Anyhew; I think tweens & teens may find these to be fun & will share it with friends who have spawn of those ages. Hi Kerry, thanks for the comment. We found all ages in the office were big fans of them. Emojis have become a cultural phenomenon, and now you can bring the fun to a face near you. 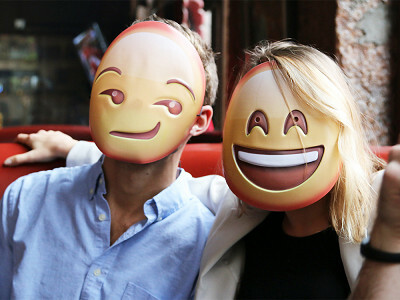 Emoji Masks are your favorite emojis—from sly face to smiley face—brought to life. Made with durable plastic to fit anyone, the masks are simple and affordable. For Founder Marshall Haas, it all started with the “moon face.” He and his colleagues used this popular emoji so much that they had an idea: why not bring it from the virtual world into the real one? Emoji Masks were born.